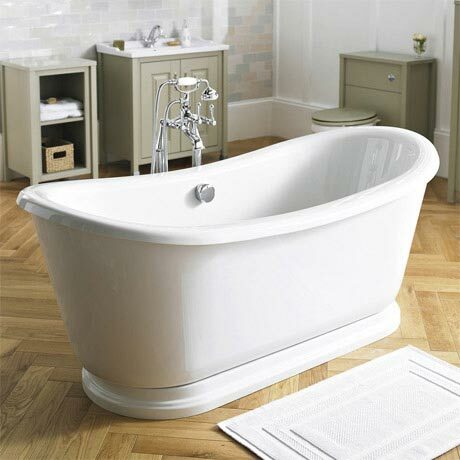 A luxury traditional double ended freestanding slipper bath with skirt from period bathroom specialists Old London. Relax and unwind in this classic freestanding bath tub, the Greenwich has been manufactured using high-grade lucite acrylic ensuring a quality finish and long lasting durability. Suitable for use with freestanding bath taps (no tap holes, not suitable for drilling). Create the ultimate centrepiece in your bathroom with Old London's sublime bath tubs. BS43035: Part 1 : 1989 baths for domestic purposes made of acrylic.